The most luxurious Foot Bath ever! Combining five temperature levels of water heating, massage therapy, magnetic field application and pedicure, the Beurer FB50 Relax Foot Bath provides a spa-standard foot treatment in the privacy and comfort of your own home! Choose from vibration and bubble functions, or combine the two for a really intense foot massage that will to get blood pumping throughout the feet. By boosting circulation you can relieve aches and pains, reduce inflammation and improve flexibility, which is perfect after a long day on your feet. Removable roller attachments on the FB50 Foot Spa also allow you to enjoy stimulating reflex zone massage direct to the soles of your feet - targeting the exact points for a deeply effective relaxing treatment. Reflexology is the practise of applying pressure to key zones on the feet which result in beneficial effects on other areas of the body, so not only is this foot spa great for your feet, it can help heal the rest of your body too. The Beurer FB50 Relax Foot Bath features six integrated magnets and eight infra-red light dots. Magnets are said to boost circulation and promote cell and tissue repair and renewal, whilst infra-red light has pain-relieving qualities and is known to help muscles relax too. Let the Beurer FB50 Foot Spa revitalise your feet. Buffing away corns, callouses and hard skin is easy because there are three interchangeable pedicure attachments. You can do this is one of two ways - either by soaking your feet in warm water which will help to soften skin or by using the foot bath without water. 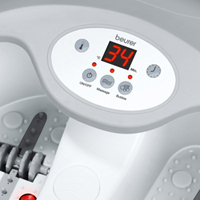 For added luxury and comfort the Beurer FB50 Relax Foot Bath has five heat settings - so you can select one that is perfect for you - and time your treatment too! This foot spa’s sleek and sophisticated LED display and touch control pad allows you to select massage function, treatment time and temperature with ease. It has a splash guard to protect against spills, non-slip rubber feet and a cord winder for easy storage. With a home spa treatment like this - your feet will be dancing for joy!